Kahal Kadosh Beth Elohim Synagogue, a National Historic Landmark, in Charleston, SC, is the country's second oldest synagogue and the oldest in continuous use. The American Reform Judaism movement originated at this site in 1824. The congregation of Kahal Kadosh Beth Elohim — meaning Holy Congregation House of God — was established in colonial Charleston in 1749, and is now the nation's fourth oldest Jewish community. The building reflects the history of Jewish worship in Charleston, as well as the high degree of religious tolerance within the Carolina colony. The Beth Elohim congregation began as an Orthodox community, founded primarily by Sephardic immigrants (of Spanish and Portuguese ancestry). By the end of the 18th century, the Beth Elohim congregation had become the largest Jewish community in the nation, with a membership of 500. This synagogue was built in 1840, on the site of the congregation's first synagogue destroyed in the Charleston fire of 1838. The building is an excellent example of the Greek Revival style, as its form, portico and rich ornamentation are adapted from classic Greek temples. Designed by New York architect Cyrus L. Warner, the temple was built by congregation member, David Lopez. By 1841, the majority of the congregation was embracing Reform Judaism, and the first service held in the new temple reflected this ideology. The Reform Movement, an attempt to modernize synagogue worship and a reevaluation of Jewish theology, had its roots in Hamburg, Germany, in the 1810s, and quickly spread throughout central Europe and to the United States. Worship reform included choral singing, organ music, and the use of German instead of Hebrew for prayers and sermons. In 1824, 47 members of Beth Elohim petitioned the trustees to abridge the Hebrew rituals and conduct prayers and sermons in English. The denial of these requests resulted in a temporary split of the congregation, but, by 1833, a united Beth Elohim had nearly 200 members supporting the Reform Movement. 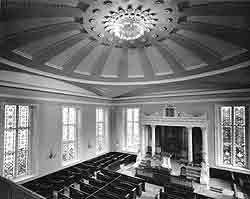 After the burning of the first synagogue and the election of a new rabbi, the inaugural service of this synagogue held in 1841 contained modernized ritual and Beth Elohim formally became the first American Reform congregation. Today, the Synagogue still serves the Reform Judaism community. A small museum contains artifacts pertinent to the history of the congregation, such as a letter written to the congregation by George Washington. Kahal Kadosh Beth Elohim Synagogue is located at 90 Hasell St., 10 blocks south of the temple's Coming Street Cemetery, the oldest Jewish burial ground in the South. The temple is open for tours Monday-Friday 10:00am-12:00pm; the gift shop remains open until 12:30pm. Call 843-723-1090 for further information.